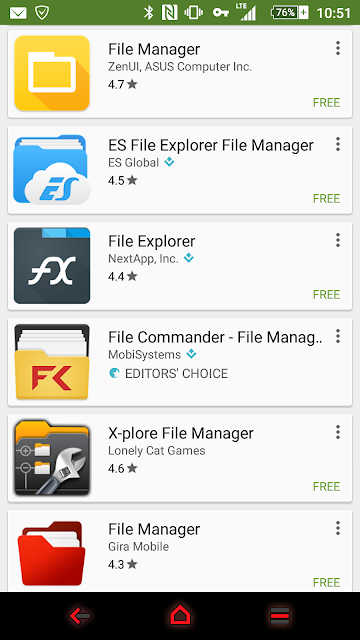 Unlike our operating system on Windows Or Mac, we have choices of different file browser on Android. It goes further than that when you start looking at all the features of each one of them. Some are strictly aiming for the ability to file browse, others aim higher with add-ons. It's a heated conversation with anyone who's been around for a while to determine which one is better and ultimately it will be up to the user. We've all done it at one point or an other by screaming loud that we've got the best file manager, but the reality of things, is that there's many good file managers with different interesting features. It will boil down to, the looks and feel, accessibility, options & features. I'm no exclusion to the above, I've battled with ES File Explorer, Solid Explorer, File Commander and I haven't found one to be perfect, I haven't been exclusive to only one, in fact, I use Solid Explorer and File Commander. They both offer different style, but they also both have very similar features that I like. File Command gives you a break down of categories of items you may be looking for directly in the first view panel with; Documents, Pictures, Videos, Downloads, Music and favorites. This allows for a quick and fast access to all the content you'd most likely will be looking for. On the other end of things you have Solid Explorer with it's first initial view your current storage view. Now, the fun thing with Solid Explorer is the ability to choose in which mode, location you'll be first brought into the app. For added convenience, swiping from right to left will give you the second browsing panel that can also be configured to be in whichever view you need. From the above, you have 2 very different style of navigational view of what you can have. In the example you've just read, this is only one of the options that are available among the file browsers and this isn't exclusive to these 2. If you take the approach of Root Explorer, as the name implies, this is for people who are of course "rooted" and would need to browse beyond their storage limitation. Root Explorer as the name implies, is one of the first and very appealing file browser for the users that need to have access to the file system to make changes on the fly. Root Explorer is however not the only one that has the ability, but it definitely was one of the first. Both File Commander and Solid Explorer have this ability within their respective options. With all the different file management options, it's hard to figure out which one works and in the end you'll need to play with a few different ones to really see which one you like. What about you? What browser are you dabbling with? Why? Comment below and share with us!